After more than a decade of offshore wind energy development in Europe there is a small but growing body of research on environmental effects. Additionally, the experience has provided insight on planning policy and mitigation of social and economic impacts on coastal communities. We are collecting a library of information potentially of relevance to fishermen involved in ocean planning in the United States. The titles, authors and abstracts are listed below grouped by subject category. Please contact john@seakeeper.org or leave a request on the comment field below, with an email address, and I will forward the full PDF of these referenced papers. If you have useful information to post or are aware of research pertaining to the interaction of fisheries and offshore wind development, or related ocean planning, please forward that information to be shared with others. We will continue to post information relevant to this evolving planning effort, including information coming out of BOEM-sponsored research in the future. In the United Kingdom, theoffshore renewables energy sector is developing rapidly. As it develops it must continue to be aware of those who make the majority of their living from the sea, on both a local and national level. The recommendations have been agreed by the Fishing Liaison with Offshore Wind and Wet renewables group (FLOWW). This group comprises of representatives from the fishing and the offshore renewable energy sector and from Government to work collectively on issues of mutual concern. They are intended as guidelines for offshore renewable energy installation (OREI) developers and the fishing community. They are based on best practice developed through the experience of the UK’s fishing community, and the offshore oil and gas and cable industries. These guidelines therefore contain much valuable information and represent an invaluable reference document. They have been compiled in a spirit of cooperation and with the intention of forming a long term partnership between the offshore renewable energy sector and the UK’s fisheries community. Both sides believe that they can continue to co-exist and, further, that the activities of each will continue to be mutually beneficial to the other; however, both also recognize that to achieve this they have to continue to work closely together. This document explains the operational detail of how the UK FLOWW group will be managed. It is intended as an information document where content may change to address the needs of the group as the group’s work progresses. UK offshore wind report 2012; The Crown Estate, London, UK. A summary of current conditions of the offshore wind industry in the United Kingdom, experiences of the previous Round 1 and Round 2 of development, and description of goals and areas designated for development in Round 3. The report includes charts showing geographic scale. The purpose of the report is to review the likely reef effects of offshore windfarm (OWF) structures and to consider the potential for enhancement and mitigation, focusing on two aspects of their physical presence : firstly, the likely reef effects on fish, shellfish and other marine biota and secondly, the potential to enhance the reef effect for commercially significant species. Government has committed to the United Kingdom generating 15% of its energy from renewable sources by the year 2020 in order to reduce carbon emissions, combat climate change and secure the UK energy supply. A significant proportion of this renewable energy will come from windfarms sited off the UK coast. The establishment of windfarms at sea has the potential to cause disruption to commercial fishing activities, including through the loss of access to some fishing grounds for the operational life of the windfarm. In light of the potential for fishermen to lose access to significant sea areas within offshore windfarms, this project was focused on supporting commercial fishermen and dependent fishing communities ashore over the long term by investigating options and opportunities for marine fisheries mitigation associated with windfarms. The overall aim of the project was to develop a menu or list of possible mitigation options which would be of use to fishermen, developers, regulatory and statutory bodies and marine resource managers in discussions related to current and future windfarm developments, as well as in other offshore industry developments and in any future consideration of marine spatial planning issues. In brief, the aim of this project can be summarized as “Identifying ways to keep fishermen fishing”. A powerpoint report on mapping partnerships between commercial fishing and the offshore renewable energy industries, with The Crown Estate, to site OWF in locations with least impact to fishing practice. 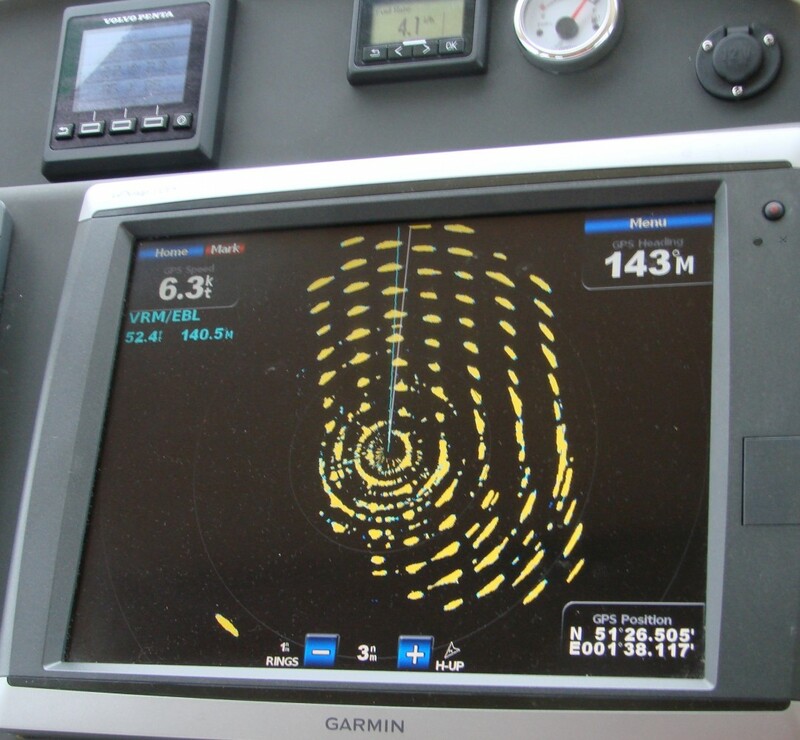 The report examines use of multiple data sets including selective use of aggregated chartplotter data from commercial fishing vessels. The project is a fishing industry led initiative which sets out a proactive and ground-breaking approach to collect, record and display the spatial extent of fishermen’s activities. This is being carried out so that the fishing industry can engage fully in marine spatial planning by having a detailed evidence base to support claims of areas fished. The data when mapped will highlight areas of importance to the fishing industry and will be helpful not just in the context of planning current and future marine renewables, underwater cabling but also in the planning of marine conservation zones. Built on a clear understanding of confidence, trust and confidentiality the fishing industry will work in close partnership with Crown Estate, and DECC for the benefit of both sectors. The project will build a foundation for mutual trust and respect between two potentially conflicting industries. A concerted effort is currently being made by industry to minimize any undesirable effects relating to windfarm development and operation. One potential effect of offshore windfarm development is the creation of underwater noise. Although the effect of underwater noise is not fully understood, it has the potential to disturb, and in the most severe cases, harm marine wildlife. Possible effects include attraction towards a noise source, avoidance, temporary hearing damage and permanent physical injury. The Crown Estate own most of the seabed up to 12 nautical miles from the British coast and lease some of this area for windfarm development. They have set up the COWRIE (Collaborative Offshore Wind Research Into the Environment) trust to conduct research into offshore windfarm development, who have highlighted the effects of underwater noise as one of several priority areas for research. This report is a review of available information on underwater noise related to windfarm development. It is one part of a larger study into the effect of windfarm related underwater noise, which includes field surveys of underwater noise from wind turbines and windfarm construction. The Maritime and Coastguard Agency (MCA) has responsibility, on behalf of the Department for Transport of the UK Government, for the safety of navigation under the International Convention for the Safety of Life at Sea (SOLAS), for the direction and co-ordination of search and rescue operations and for the prevention of marine pollution. MCA’s programme was intended to assess the effect of the wind farm structures on marine systems in operational scenarios. The trials assessed all practical communications systems used at sea and with links to shore stations, shipborne and shore-based radar, position fixing systems, and the Automatic Identification System (AIS). The tests also included basic navigational equipment such as magnetic compasses. Concern has been expressed over the possible effects of underwater noise in degrading the underwater habitat. Underwater noise is created by many human activities, such as fisheries, oil and gas exploration and production, ship traffic and offshore construction. The underwater environment may be characterized as a medium in which light is poorly transmitted but through which sound propagates over long distances. Hence, marine animals may rely heavily on sound to communicate, to exploit and investigate the environment, to find prey and to avoid obstacles. At the most extreme levels of exposure, underwater explosive blast may even cause death and lethal injury to marine animals. This is less likely at the lower levels of noise encountered during most other offshore construction activities, but even in the absence of physical effects there is a residual risk of the noise causing behaviour changes in marine mammals and fish. Since the impacts caused by waterborne noise cannot yet be completely predicted or fully understood, Subacoustech Ltd has been contracted by The Crown Estate on behalf of the Collaborative Offshore Wind Research Into the Environment (COWRIE) to measure the underwater noise generated by offshore windfarms during construction and operation. The purposes of the programme of measurements are to evaluate the pre-existing background noise environment, to rate noise during operation of windfarms in terms of its potential for environmental effect, and to provide information which will aid the estimation and minimisation of the impact of noise during the lifecycle (construction, operation and decommissioning) of windfarms. In June 2010, Ichthys Marine published a report for COWRIE that considered the options and opportunities to mitigate any impacts that may occur to the fishing industry as a result of the construction of offshore windfarms (Blyth-Skyrme 2010). 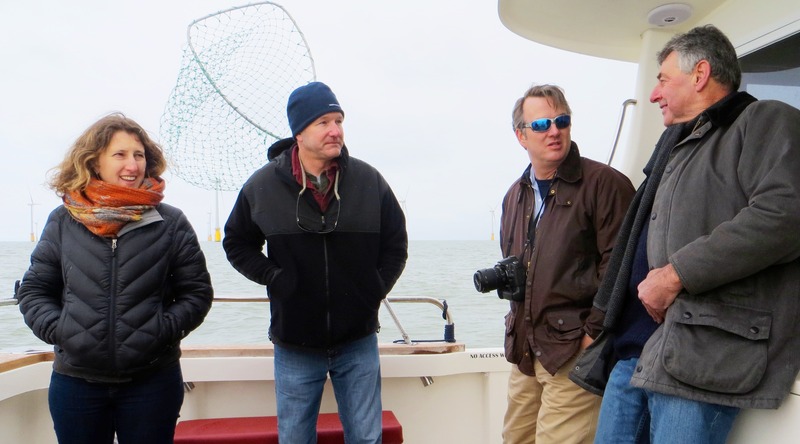 A menu of possible mitigation options was created, which could be used by fishermen, developers and other interested parties in discussions related to current and future developments. 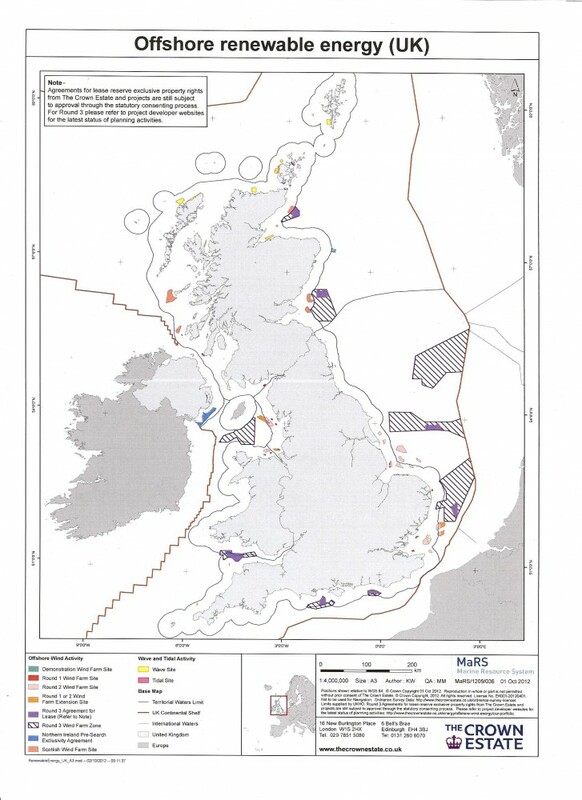 One of the options identified to mitigate impacts was to co-locate windfarms with marine conservation zones (MCZs). This was because MCZ conservation objectives may require that some or all fishing activities are stopped inside these sites, while some or all fishing activities may also be excluded from windfarms for safety or infrastructure protection reasons. Hence co-locating rather than separately siting windfarms and MCZs might reduce their combined impact on the fishing industry.